Baked Herb Polenta Sticks recipe is an interesting and tasty way to serve polenta to your family or friends. Polenta is made from ground cornmeal, much like grits from the American South. But polenta and grits are not one the same. Polenta is a northern Italy dish that is made from yellow cornmeal. Very easy to make and so delicious. Broiling the polenta sticks give ad golden and crispy finish with a creamy interior. These polenta sticks could be served as an appetizer or as a side dish. 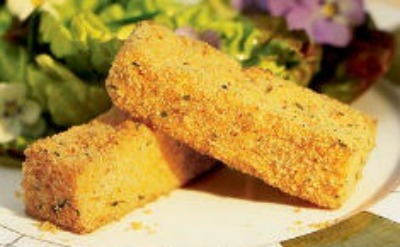 Baked Herb Polenta Sticks would be delicious served with a Marinara or Arrabbiata Sauce to dip them in. * Learn how easy it is to make your own homemade chicken stock. Butter a 13x9-inch baking dish and cover bottom of dish with parchment paper. In a large heavy pot, bring vegetable or chicken stock to a boil and add salt. Reduce heat to low and whisk in cornmeal in a slow steady stream. Cook mixture, whisking until thick, approximately 20 minutes. Remove from heat. Add lemon zest, butter, 1/2 cup Parmesan cheese, basil or sage leaves, and pepper; stir until butter is incorporated. Working quickly, spread polenta evenly in prepared dish and refrigerate until firm. NOTE: Polenta may be prepared up to this point 1 day ahead, covered and refrigerated. Preheat broiler and butter a baking sheet. When ready to serve, cut into sticks or into interesting shapes with cutters. NOTE: Cut into small interesting shapes with fluted edges. 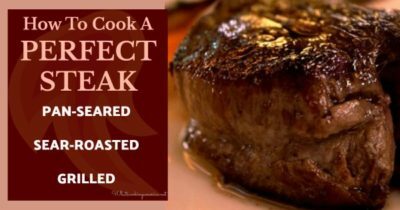 This way you can make a nice presentation by using two or three on each plate. Sprinkle tops with remaining Parmesan cheese and dot tops with butter. Broil about 4 inches from heat approximately 4 to 6 minutes or until golden; turn polenta pieces over and sprinkle with remaining Parmesan cheese and broil another 2 to 3 minutes or until cheese is golden. Source: Photo by James Carrier of Sunset Magazine.